Part 2 of the 9-part Glitter Village Series. Series. All 9 are stitched on 32 count Raw/Silver linen by Zweigart. Each design has a stitch count of 57w x 57h. 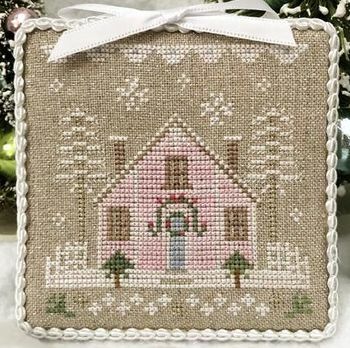 If the entire series is stitched on one piece of linen, it has a stitch count of 177w x 177h, which includes leaving 3 stitches between each of the blocks.